La Cava, the great Chicago-based company that brought us such notables as the Tatami Shower Base, the Waterblade faucet and the Suave bathtub surround (pictured above); is having a clearance sale. This is no 10 percent off sale that's not really a sale either. Most of the components in the clearance section of their website are more than half off. Wow, when these folks do something, they go all out. I went through the hundreds of sale items on their site and found a couple of highlights. This is the Aquagrande wash basin and wall-mounted cabinet. It normally sells for $1790 and it's available now for $900. 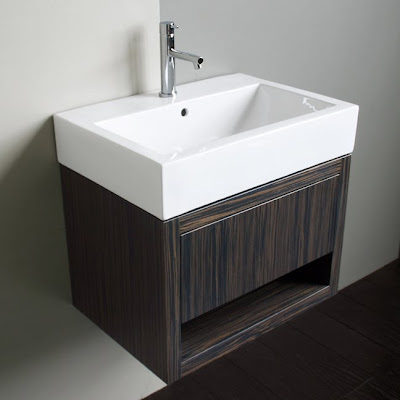 This is the Paestum vanity base and it does not include the integrated sink you see here, though it's certainly available. The cabinet's in an antiqued walnut and it normally sells for $1790. Right now though, it's available for $895. This is the Venezia vanity and it comes as the set you see here. This vanity is so Italian I can barely stand it. Wow! Anyhow, the steel stand comes with a glass shelf and it includes the Carrera marble counter, an undermount sink, the drain and trap assembly and La Cava's three-piece Stilmar faucet. This ensemble regularly retails for $4900 and can be yours today for $1900. A lot of La Cava's offerings are pretty modern, but not all of them. La Cava can handle traditional and old world styles with equal panache. Witness the Ventotene vanity above. The Ventotene vanity sells for $3080 ordinarily and is on sale now for $1540. This sale price is for the vanity cabinet only, though coordinated counters and sinks are readily available. And in keeping with the spirit of La Cava can handle traditional styles, this is the Old England Vanity in antique walnut with brass accents. This is a solid walnut vanity and it usually sells for $4994. This exceptionally well-made vanity is currently on sale for $1248 and that doesn't include the integrated counter and sink shown. Still, that is quite the bargain. If you're in the market for some interesting components for a bathroom makeover, be sure to spend some time with La Cava. In the immortal words of Shirley Temple, "Oh my goodness!" Pick me for that Aquagrande vanity which would look oh so perfect at The Fish House. Actually, it's probably a little too "grande" for our Fish House. You have a fish house? Fantastic! That Aquagrande is asking to be hung on a full wall mosaic, n'est-ce pas?